Are you still buying granola in a box? If so, it’s time to consider making the switch to the homemade variety. It’s (sooo!) easy to make, customizable, and best of all, cheap. 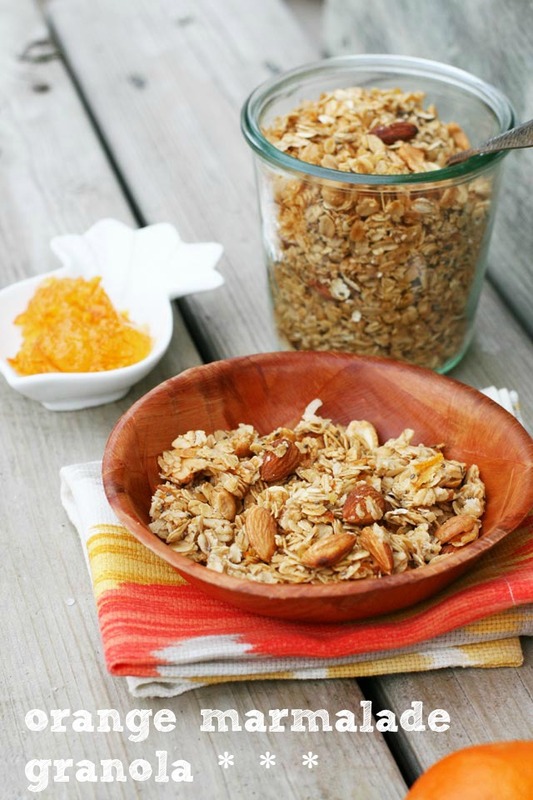 This particular granola has a unique orange flavor, made possible by orange marmalade. If you’re feeling experimental, you could certainly try adding blood orange marmalade, grapefruit marmalade, or another flavor. You can even use jelly/jam instead of marmalade, giving you even more options. For granola that forms into clumps: Use 1/3 cup liquid (coconut oil, honey, marmalade, jelly, etc.) per 1 cup of oats. This version is slightly higher in fat and calories than the one listed below. For granola that is more granular/doesn’t stick together: Use 1/4 cup liquid (coconut oil, honey, marmalade, jelly, etc.) per 1 cup of oats. This version is lower in fat and calories. See section above regarding "clumpy" granola versus "granular" granola that falls apart. Then follow the recipe amounts below based on your preference. 1/2 cup additional ingredients: Almonds, chia seeds, coconut, other nuts, dried fruit (add after baking), etc. Preheat oven to 350F. Spray a large cookie sheet with non-stick cooking spray.. In a small saucepan, combine orange marmalade, coconut oil, and honey. Turn heat to medium and stir until coconut oil is melted and ingredients are combined. Place oats and other ingredients in a large mixing bowl. Pour liquid mixture over the dry ingredients and mix well. Spread granola on prepared pan. Bake for 20 to 25 minutes, stirring once about half way through. Remove from oven and allow to cool. Once granola is cool, break into pieces and transfer to an airtight container. Store, covered, for up to 2 weeks. Serve with milk or on top of yogurt.